Have additional questions about Magic Documents that aren't answered in our other articles? Check here! What will happen to all my old documents? Your old documents will remain on the old technology and work the same as before. 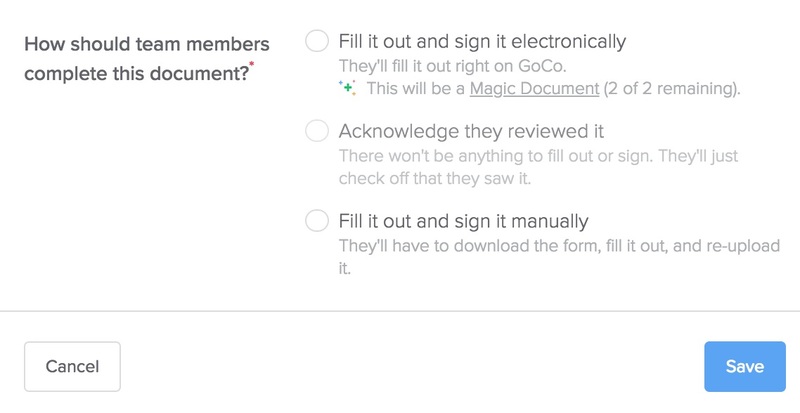 All new documents that you add to GoCo will use the new Magic Documents experience. Can GoCo still complete my documents for me? Now that you have the tools to build your own documents, GoCo will no longer be completing them on your behalf. If you ever run into an issue with formatting or have general questions, we are definitely available to assist with that. Just email help@goco.io! Is the employee sign & review experience different? Yes, but now it's better! Employees will no longer see a box on the right hand side for them to fill in their signature or custom fields. Instead, they will sign the document just like they would in real life, by signing directly in the document. Why does the builder look different for PDFs vs. Word documents? The PDF experience is designed for documents you would typically consider forms, agreements, or policy acknowledgements - documents that have checkboxes, dropdowns, multiple choice, etc. When building a PDF, you can drag and drop fields into your document. The Word experience is designed for documents that are typically more free-flowing, like offer letters or contracts. When building a Word document, you can type right into the document and embed text fields into existing paragraphs. If the builder you are using is not working for your specific document, try converting it to the other version (PDF or Word) and re-uploading. Can I send a document to an external party? You can only send documents to employees that are in GoCo as of today. What is the difference between a Magic template, Acknowledge only document and a Normal template? Please note, Complete HR includes only 2 Magic Templates. Additional templates require you to upgrade to Premium HR. Who can send a magic document? Any full access admin or limited access admin with the Manage Company Settings permission can send and create magic documents. Any other questions? Email help@goco.io!